Lyceum Series to Present "A Christmas Carol"
U.S. Senator Jim Talent (R-Mo.) has secured $250,000 for the Truman State University Enhanced Speech and Hearing Clinic in the 2006 Department of Transportation, Treasury, Judiciary, Housing and Urban Development and Related Agencies Appropriations Act, which passed both houses of Congress and was sent to the president for signature on Nov. 28. Talent’s request must be signed into law by the president. The Truman State University Kohlenberg Lyceum Series is proud to present the Nebraska Theatre Caravan’s production of “A Christmas Carol” at 7:30 p.m., Dec. 6, in Baldwin Auditorium. Packed with laughter, pageantry and gorgeous costumes, every memorable detail of Charles Dicken’s classic tale of Christmas spirit springs to life in the Nebraska Theatre Caravan’s production of “A Christmas Carol.” Join Ebenezer Scrooge on his magical journey to discover the true meaning of Christmas in a production complete with spine-chilling ghosts and a heartwarming finale. The Nebraska Theatre Caravan’s national touring production of “A Christmas Carol” has been an American holiday tradition for more than 25 years, and has performed in more than 600 cities in 49 states and three Canadian provinces. A limited number of tickets for “A Christmas Carol” will be available Nov. 29. Seating is general admission. Admission is free for students, faculty and staff with their University ID. Students may pick up tickets at the Student Activities Board Office, lower level of the SUB. Faculty and staff may pick up tickets at the Center for Student Involvement, lower level of the SUB. Bryan Cunningham will present two seminars entitled “Information Security: From the White House Situation Room to the College Classroom” Nov. 30 as part of a Collegis Leadership Series. Cunningham’s first seminar will take place in conjunction with the Center for Teaching and Learning’s Weekly Lunch Series at 12:30 p.m. in the Student Union Building Alumni Room. Cunningham will also speak at 6 p.m. in the Student Union Building Alumni Room. Students, faculty, staff and the public are invited. He will discuss a comprehensive and cost-effective approach to network security for educational and other entities potentially subject to federal law, state information security breach disclosure, and federal and state regulations. He will discuss effective strategies for mitigation of legal risks for executives for breaches of network security. Cunningham has extensive experience in information security, intelligence and homeland security matters, both in senior U.S. government posts and the private sector. Cunningham, now a corporate information and homeland security consultant and principal at the Denver, Colo., law firm of Morgan & Cunningham LLC, most recently served as deputy legal adviser to National Security Adviser Condoleezza Rice. At the White House, he drafted key portions of the Homeland Security Act. Truman is pleased to announce the annual internship for two Truman State University students at the Truman Presidential Museum and Library, located in Independence, Mo. The internships have been made possible by a generous endowment from the family of Fred and Ethel Schwengel. The internships are for summer 2006, and are open to all Truman juniors and seniors who meet University requirements for an internship. Students can earn up to five hours of credit for this full-time internship. After being selected by a University committee and the Truman Library staff, the interns may work in a variety of areas of the library including archives, public relations, marketing, educational programming, museum development or visitor services. Assignments will be based on the interns’ abilities and interests along with the library’s needs. The internships offer a five-hour (in-state) tuition scholarship. Guidelines for the internships require that selected interns must “immerse themselves in the study of President Truman.” At the conclusion of the internship, the intern will write a paper on his or her experiences at the Museum and Library and on a specific study of the Truman presidency. The internship schedule will allow time for each intern to research the project. Potential interns must have strong communication skills, both written and verbal, strong organizational skills, the ability to work independently on multiple tasks, basic computer skills, dependability and self-motivation. Applications must be received by Jan. 27. For more information and applications, contact Jeff Gall, associate professor of history and social science education, at 785.7747 or jgall@truman.edu. Pictured front row (left to right) Chris McKinney, Laura Keck, Lauren Bolland, Meg Fullenkamp, Peter Howe, Trey Robinson and Chad Mohler. Back row (left to right) Winston Vanderhoof, Amy Currier, Robin Taylor, Laura Lukowski and Shane Reiser. Not pictured are Steven Chau, Lisa Dodge, Sunnie Hughes, Marcie Kotteman, Dawn Runge, Denise Smith and Cindy Thomas. Representatives from the Homecoming Committee, Student Activities Board and the SERVE Center presented two checks to Habitat for Humanity members of the Truman and Kirksville chapters on behalf of Truman students who raised money during the 2005 Homecoming philanthropy campaign. Money collected for Habitat for Humanity House No. 6 from Oct. 17-21 came to a total of $4,374.08. Funds collected for Hurricane Katrina victims on Oct. 22 came to a total of $501. Fund-raisers sponsored by Truman’s Habitat for Humanity organization; the SERVE Center, who helped with the collection of money on Make a Difference Day; and Student Activities Board, who funded a mechanical bull during homecoming festivities, helped raise this money. 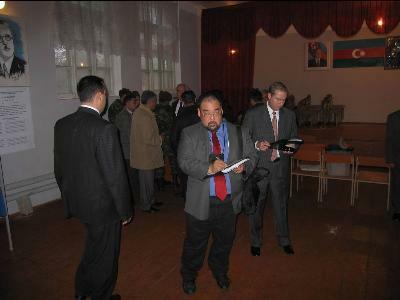 John Ishiyama, professor of political science and director of the McNair Program, served as an Election Monitor/Observer for the Nov. 6, parliamentary elections in the Republic of Azerbaijan. The Rotary Foundation Ambassadorial Scholarship offers students the opportunity for study in a foreign country. To be eligible for this scholarship program, students must have completed at least two years of college-level coursework or equivalent professional experience before commencing their scholarship studies, be proficient in the language of the host country, and be a citizen of a country in which there is a Rotary Club. The academic year scholarship covers transportation between home and the study city, some educational supplies, academic fees, and reasonable housing and meals. Awards generally range from $11,000-$25,000, depending on actual costs at the assigned study institution. In return, the scholar is asked to be an ambassador of goodwill by making presentations in the host and sponsoring communities. For more information or to pick up an application, contact Marilyn Romine, business and accountancy academic adviser, at 785.4268 or in Violette Hall 2431 or Matt Eichor, director of justice systems, at 785.4667 or in Pershing Building 334. Information also is available at the Rotary International Web site, http://www.rotary.org. Applications are due Feb. 24, for planned international study between July 1, 2007, and June 30, 2008. Applications should be returned to one of the contact people before 5 p.m. on the due date. An informational meeting is scheduled for 4:30 p.m., Dec. 6, in Violette Hall 1412. The Beta Chapter of Phi Sigma Pi national co-ed honor fraternity at Truman received three national awards presented at the National Convention Nov. 12 in Atlanta. The chapter received the Joseph Torcia Outstanding Chapter award for 2004-2005, the 2005 Best in Region award for the Central Region, and the 2005 Outstanding Web site award. The Joseph Torchia Outstanding Chapter award is the most prestigious national award which can be bestowed upon an undergraduation chapter. The award was originally established in 1957, with one award being given every two years. Since 1966, the award has been given on an annual basis. Modifications were made to the criteria in 1970 to allow for up to three chapters per year to win the award, and it was renamed to honor Torchia for his outstanding contributions, years of service, and dedication to Phi Sigma Pi. Currently, the criteria allows for five percent of the total collegiate chapters to be eligible for the award. All chapters apply for this award each year by submitting the Form 110 to the National Headquarters by June 1 and Jan. 1 of each academic year. Chapters are evaluated on the basis of chapter activities as well as the extracurricular events and academic achievements of their members. The chapter’s Web site is http://psp-beta.truman.edu. The philosophy and religion discipline will host oral defenses for this fall’s senior seminar students Nov. 28-Dec. 1 in Baldwin Hall 100. The public is invited to all sessions. For more information, contact Ding-hwa Hsieh or Patricia Burton at 785.4636. Marc Becker, associate professor of history, will moderate with members of the northeast chapter of Phi Beta Kappa to help examine the role of water in global and local politics and economics. Those in attendance will be able to hear music developed just for the local Hazel Creek initiative by James Harmon, professor of art history. Please R.S.V.P. by Dec. 1 by calling 1.800.452.6678 or 660.785.4016. W. Michael Ashcraft, associate professor of religion, presented his paper, “The History of the Development of New Religions Studies in the Seventies and Eighties: Multiple New Religions, Multiple Scholars, Multiple Theories, Multiple Methods” at the annual meeting of the Society for the Scientific Study of Religion in Rochester, N.Y., on Nov. 5. Janice Grow-Maienza, professor of education, with Susan Beal of the Institute for Mathematics and Science at the University of Illinois Chicago, presented an invited paper titled “Exploring Korean Mathematics” at the First International Curriculum Conference at the University of Chicago on Nov. 12. The conference, which included invited speakers brought from China, Japan, Singapore and Korea, was sponsored by the NSF-funded Center for the Study of Mathematics Curriculum, a consortium made up of mathematics educators from the University of Missouri, the University of Chicago, Western Michigan University and Michigan State University. Erin Palmer, Centennial Hall student adviser and a sophomore psychology and justice systems double major from Kansas City, Mo., presented a diversity program and facilitated discussion titled, “Angry Eye,” at a recent conference for Residence Hall Leaders, the Midwest Association of College and University Residence Halls (MACURH). She received the award of Top 10 Program, out of nearly 100 programs. Thomas Trimborn, professor of music, will be signing his book “Encounters with Lincoln: Images and Text” Dec. 8. The book includes 31 of the author’s unique portraits, tells the Lincoln story from an artist’s point of view, combining art, music, poetry and the historical record. Contact Trimborn at trimborn@truman.edu for more information about his upcoming book signing. April Carter, a senior exercise science major from Carthage, Mo. ; Breena Helle, a senior exercise science major from Williamsburg, Iowa; Nicole Helle, a senior exercise science major from Williamsburg, Iowa; and Dorothy Matta, a junior exercise science major from Quincy, Ill.; received the Patricia McSwegin Research Award for their project titled “Differences in Cardiovascular Efficiency Between Heel-toe Running and the Pose Technique.” This award is to be given to the student researcher(s) with the best presentation at the Missouri Association for Health, Physical Education, Recreation and Dance convention. They received the award Nov. 13 during the convention at Lodge of the Four Seasons in Lake of the Ozarks, Mo. The four researchers were mentored by Alex Koch and Michael Bird, both associate professors of exercise science. The Truman State University Mock Trial team attended the Quincy Invitational Tournament. Truman took two squads. One squad finished the tournament with a record of 2-2, while the other squad won one of four games. Rachael Spavone, a senior political science major from Springfield, Ill., and Megan Pfister, a senior psychology major from St. Louis, won awards for best witness. Bryan Gelecki, a sophomore political science and justice systems double major from Papillion, Neb., won an award for best attorney. Several Truman staff were honored at an Upper Midwest Region of the Association for College and University Housing Officials. Joshua Lemmer, residence life area coordinator, and Michael Houlahan, Centennial Hall director, received the award of a Top Five Program out of 132 total programs, for their program titled, “The FRED Factor.” Andrea O’Brien, director of residence life, won the award of Best Overall Newsletter Submission for 2005, with her article, “A ‘Real’ Job.” O’Brien was also voted into a two-year term in the executive office position of secretary for UMR-ACUHO. Mark Lowry, Grim Hall/Apartments director, was elected to chair a committee on environmental, safety and physical change for one year. Student Senate is sponsoring an off-campus living forum at 7 p.m., Nov. 29, in the SUB Spanish Room. Speakers will discuss the current off-campus living situation. Free refreshments will be available. Contact Mindy Maness at mam434@truman.edu for more information. The Physics Colloquium will feature Sergei Kopeikin from the University of Missouri-Columbia Department of Physics and Astronomy at 4:30 p.m., Nov. 30, in Barnett Hall 112. The presentation will be “Gravitomagnetism and the Lorentz Invariance of Gravity in the Gravitational Light-Ray Deflection Experiments.” Contact Taner Edis at 785.4583 for additional information. The Center for Student Involvement is presenting a Perfect Publicity workshop from 7-8 p.m., Nov. 30, in the SUB Activities Room. This workshop will inform students and organizations about the publicity avenues that are available across campus and off campus. Students may stop by the CSI for more details about winning $100 by attending the workshop. Call 785.4222 for more information. The final installment of the fall semester’s Global Issues Colloquium will be at 7 p.m., Dec. 1, in Violette Hall 1000. The subject is “Water Wars: From Bolivia to Hazel Creek.” Marc Becker will moderate with members of the northeast chapter of Phi Beta Kappa to help examine the role of water in global and local politics and economics. Contact the Center for Teaching and Learning at 785.4391 for more information. Tag, the new improvisation group, will be having try-outs at 7:30 p.m., Dec. 1, in the SUB Alumni Room. Log on to http://www.tagimprov.com for more information. The Nursing Program is hosting a World AIDS Day Vigil at 8 p.m., Dec. 1, at Kirk Memorial. All students, faculty, staff and community members are encouraged to attend to share and reflect on the lives of those with HIV and AIDS. Contact nursing@truman.edu for more information. The Observatory will be open to the public, weather permitting, from 8:30-10:30 p.m., Dec. 1, at the University Farm. Contact Michael Adams at 785.4088 or log on to http://observatory.truman.edu for more information. The Truman Biology Seminar Series will continue from 12:30-1:20 p.m., Dec. 2, in Magruder Hall 2050. Timothy Rice, assistant professor in the department of biology at the University of South Alabama, will be presenting “A Survey of Environmental Contaminant Levels in the Mobile/Tensaw River Delta, Alabama.” Refreshments will be served at 12:15 p.m.
Students, faculty and staff are invited to join IT Services at their regular series titled “Tech Break” on Friday afternoons. Go to http://its.truman.edu/techbreak for more information. The Board of Governors will meet at 9 a.m., Dec. 3, in the SUB Conference Room. SAB is sponsoring a poker tournament at 1 p.m., Dec. 3, in the SUB Activities Room. The first 90 people will be admitted. Truman students may play for free. Contact SAB at 785.4722 for more information. The Coalition of American Women is sponsoring a Kwanzaa dinner from 2-6 p.m., Dec. 3, in the SUB Georgian Room. Everyone is invited. There are only 150 seats available. There will be performances to demonstrate the seven principles of Kwanzaa. Contact Alyssa Johnson at alj074@truman.edu for more information. The Truman State University Symphony Orchestra will perform Beethoven’s “Symphony No. 5” at 8 p.m., Dec. 3, in the Ophelia Parrish Performance Hall. Sam McClure will be the conductor. Admission is free. The Assessment Colloquium will feature Marcie Kotteman presenting her research on the “History of Assessment at Truman” at 4:30 p.m., Dec. 6, in the SUB Spanish Room. Phi Kappa Phi is accepting applications for the 2006-2007 Study Abroad Grant competition and the 2006-2007 Graduate Fellowship Competition. Application materials are available online at http://phikappaphi.org. Contact Wynne Wilbur at 785.4435 for more information.